Note: Strawberry Cheesequake actually became a full time blizzard at some point. 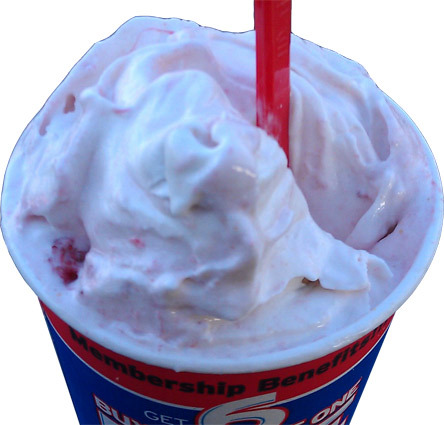 For May 2014, we are getting a Strawberry shortcake blizzard which I hope to review soon. Check it out, we are flipping over to 2012 with back to back DQ reviews, how cool is that? I think it rocks, but keep in mind, this is all thanks to the mobile version of the DQ website. That's right, while the DQ blog and blizzardfanclub.com website always take forever to switch to the new blizzard, browsing dairyqueen.com with my mobile phone told me early this morning that they had flipped over to the Strawberry Cheesequake blizzard. Knowing we would be out and about again, I smelled a perfect excuse to head back to DQ. 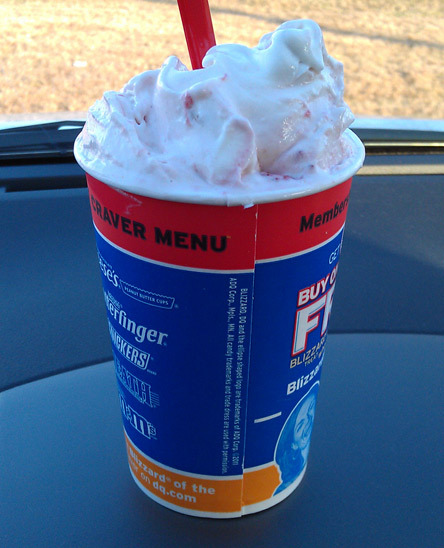 Here ya go, one medium Strawberry CheeseQuake blizzard sitting on the dash of my wife's rental car (realllllll long story). Medium you say? That's right, I'm starting the new year off cheap! woohoo! No, seriously, I was assuming that there was an impending tidal wave of cheeziness approaching, so I decided to not get my own blizzard. Instead I scooped off the top (into the cover) for my quick sampling, and then gave the rest to my cheesecake loving wife. But see, now we have a problem. I never actually read the description of this blizzard. I saw CHEESEQUAKE and assumed I would be buried under an avalance of cheeziness. Sure, I didn't actually think about how they would inject cheesecake flavor into this one, but hey, if there is pumpkin puree, why not cheesecake puree.... hahaha, oh man, how funny would it be if there was such a thing? cheesecake lovers everywhere would rejoice! "Real Chunks of rich cheesecake and strawberries blended with creamy vanilla softserve"
That's the actual description ---- I'd call that a chunk all right! Oooooooooooooo, so chunks are where the cheeseQUAKE comes from, but, ummmmmm, it's not really a QUAKE.... or a shake... or even a tremor. How about CheeseWhiffle? CheeseZephyr? I'm still waiting for you to pass the cheesePlease? Yeah, there's like, umm, not really any cheese flavor here and it's kind of confusing. Oh, sure, there are tons of these big cheesecake chunks, but they don't really taste like cheesecake. You could just have easily called this a strawberry shortcake blizzard and we wouldn't have known the difference (full disclosure: my wife came up with that last statement, and she's right). Now don't get too upset, this isn't a total loss. 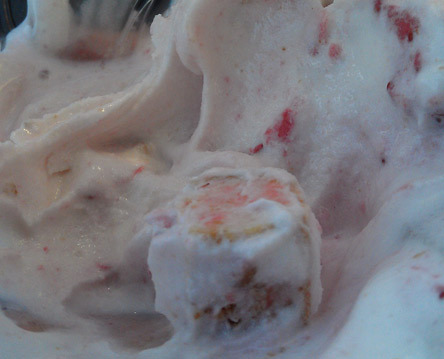 This is the same awesome strawberry base they used in the June 2010 Strawberry Golden Oreo Blizzard. As soon as I tried it, I totally regretted not getting my own because I wanted more of the creamy, strawberry goodness. Sure, they could probably double blend this to spread out the cheesecake flavor, but I didn't care, I really just want the strawberries. So, it's up to you on this one. If you dig strawberries, give this a try. If you are only doing it for the cheesecake, well, you are on your own. The chunks are certainly fun enough to eat. They are big, soft, and taste fine, it's just that they don't really taste like cheesecake.... though, ironically, this blizzard did leave us both with this most mild of cheesecake aftertastes. On my quest to try all of the walgreens pints out there, I currently have a strawberry cheesecake variety in my freezer. I'm a little anxious about trying it though seeing as I haven't had cheesecake in ages and I don't remember it being too spectacular. I'll be sure to let you know what I think about it once I get the nerve to open it up. I tried the flavor and I can't really describe how it tastes=p. It has a slight cheesiness to it but nothing offensive and it worked well with the strawberry swirl. Not something I'd crave but definitely a nice change of pace. Ok, glad to know our flavoring wasn't a fluke. I'll never understand why they say one thing and then sell another.